Made this for a a dear couple's wedding anniversary, using the Di Hickman sketch, do check out the other design team's examples. Discovered this adorable blog today, and Kazan is having a sketch challenge too, just had to join in! Made this card for a friend who is getting married soon. 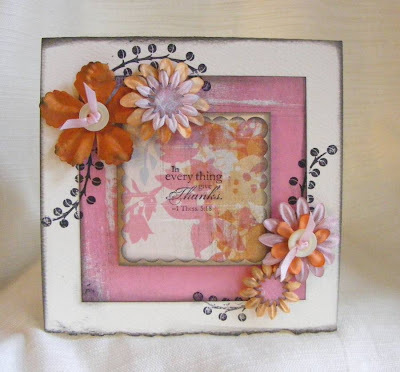 PP - Basic Grey, stamp - Anitas & Stampin Up!, Flowers - Prima and sun punch, Scallop Square punch - Woodware, buttons and ribbon from stash. Made this using latest CPS sketch, love Basic Grey! 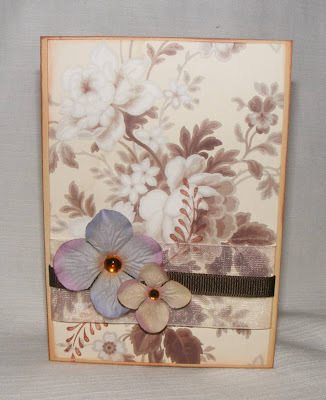 PP by Basic Grey, Flowers by Prima, stamp by Hero Arts, gems and ribbon from stash. Forgot to add link to Lavinia stamps. 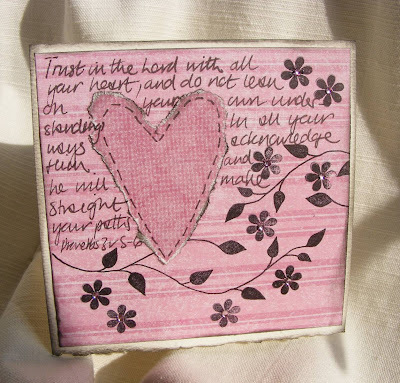 Bought some in Llangollen at a craft shop, there is an online shop, please have a look, there are some lovely designs. I've been a naughty blogger, and have neglected my blog for 2 weeks!!! I know this as my last entry was the Salt challenge and now I have another. The theme is Walking in the Love of God, this verse was brought to mind, such a well used one, but so true and so comforting. 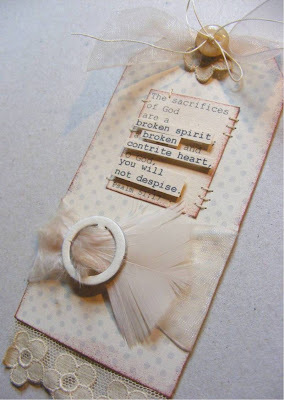 Please have a look at the other creations on SALT, they are so inspiring. 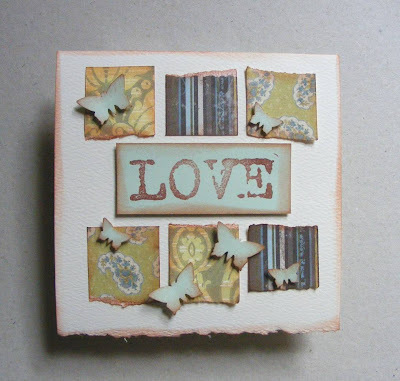 PP by HOTP, Stamps by Lavinia stamps, gems from stash. Last weekend was busy, we had a thanksgiving service for Ethan and Jadon, and my mum and dad, and aunt and uncle were visiting. My aunt is my mum's youngest sister and they live in Australia, the last time I saw them I was 14! I didn't take lots of pics so I'm hoping they'll email me some. 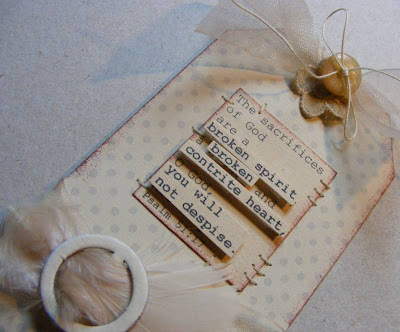 I was searching a verse that conveyed this them for me, and I came across Psalm 51, it reminded me of a time when I had disobeyed God and was feeling far from him and quite guilty, this verse helped to restore me and reassure me of God's forgiveness. Praise HIM! 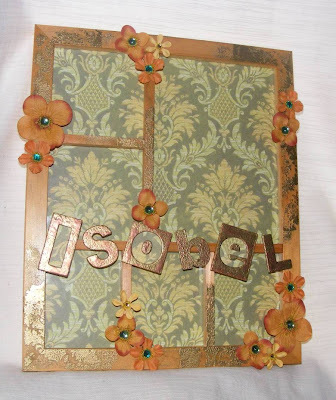 I have also recently been inspired by some beautiful European blogs, Bibbi and Flo's . 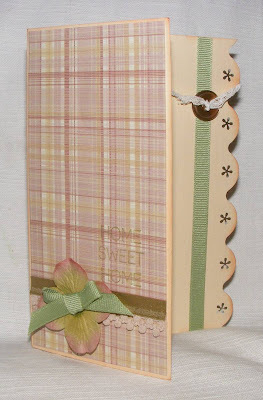 Tag by Melissa Frances, Chipboard Buckle by TLC, lace, ribbon, button, thread and feather from stash. 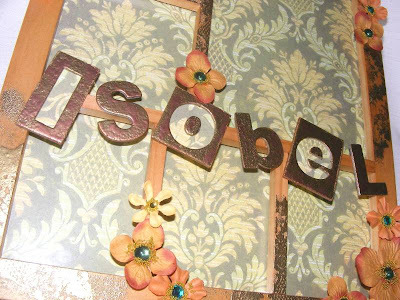 Was comissioned to make something for a baby's blessing present, the brief was Autumnal colours and her name. 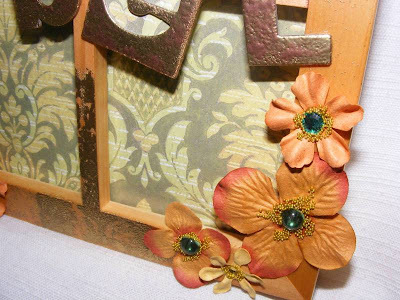 PP and stamp by Anna Griffin, chipboard letters by TLC, flowers by Prima, gems and accent beads. PP by Diane's Daughters, flowers by Prima, Stamp by Anitas, button, ribbon and lace from stash, Fiskars scallop scissors and PunchBunch flower punch. 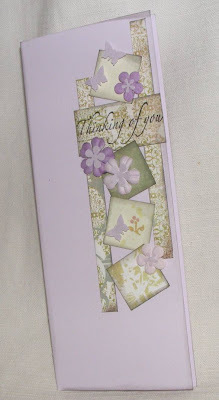 PP by Anna Griffin, flowers by Prima, stamp by Anitas, ribbons and crystals from stash. PP by Basic Grey, Brenda Walton and others. 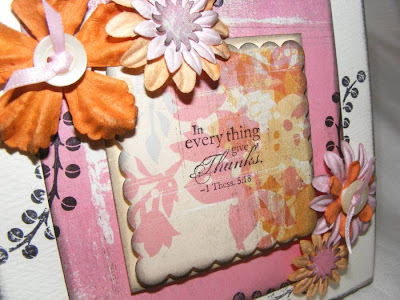 Stamp by Rubber Stampede, flowers by Prima.